The power of being Andy Warhol. Not being commissioned for the cover design of an album, and yet having your stamp of approval all over it. 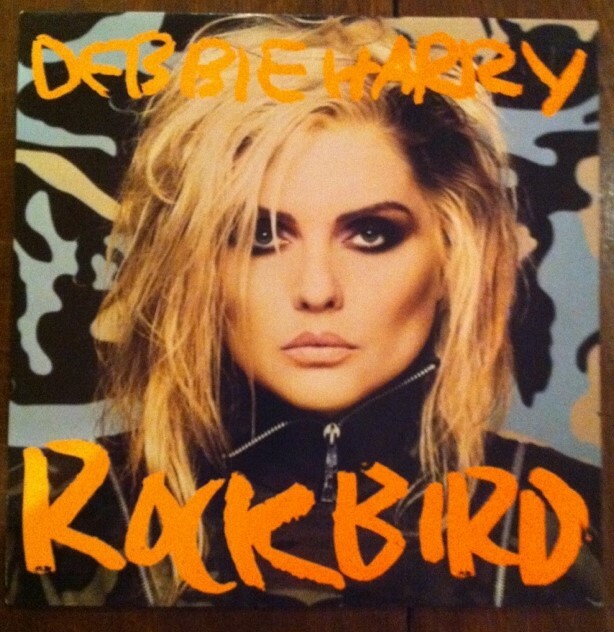 I’m talking about the album Rockbird by Debbie Harry, released in 1986. 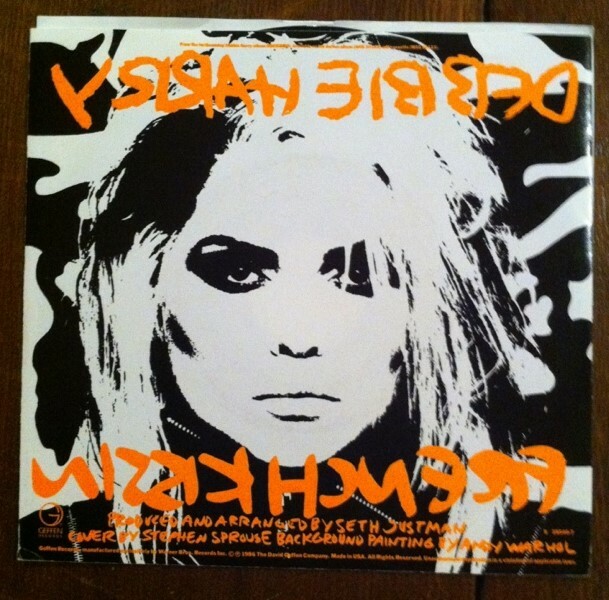 The second solo album by the front lady of Blondie, who also happened to be one of Warhol’s muses. His 80’ies Marilyn Monroe, so to say. With the only difference Deborah was (and still is) very well alive. The lettering on the album is done by Sprouse, in his 4 signature marker colours yellow, orange, green and pink. Same colours and lettering he used for his Graffiti series of bags and T-shirts for Louis Vuitton. And also a book about Sprouse is issued in four similar coloured covers. 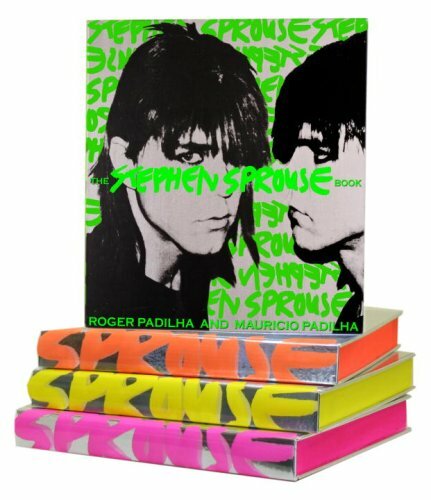 Book on Stephen Sprouse (Rizzoli, 2009). Jacket art in 4 colours. Cover portrait by Warhol. 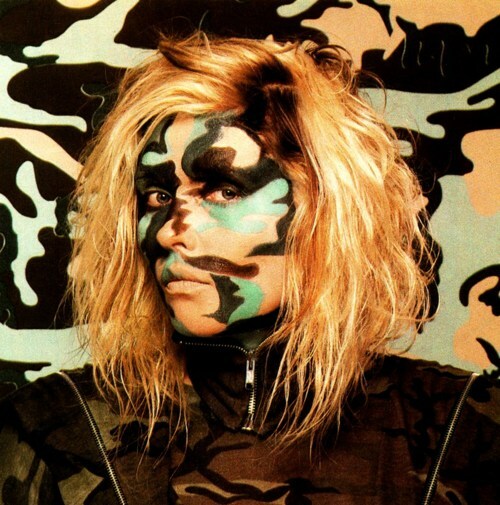 Stephen Sprouse (1952-2004), fashion designer, former roommate of Debbie Harry and a friend of Warhol’s, got the permission to design a clothing line based on Warhol’s camouflage series, in day glo colours. 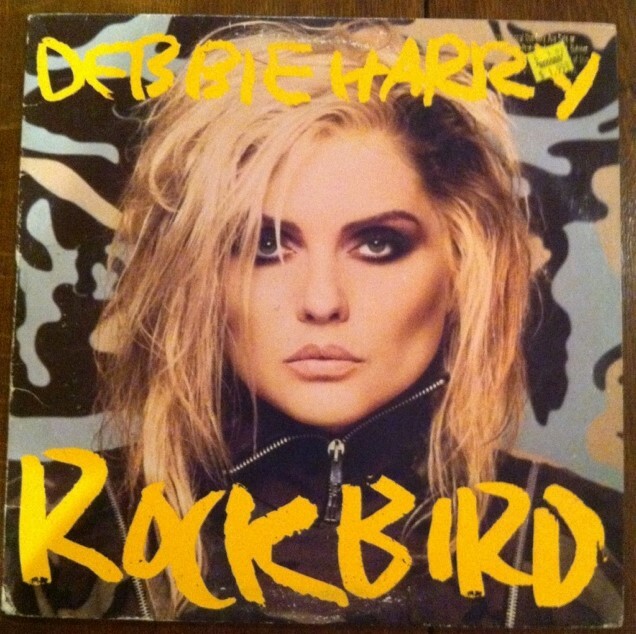 Together they designed some outfits for Deborah Harry, to wear for the album cover and in video clips for the album’s hit singles. Warhol and Debbie Harry are talking abouth the videos and the clothing in an episode of Warhol’s 15 minutes on MTV. In fact Harry is wearing one of the dresses in the show, and Warhol signs it. The single French Kissin’ in the USA was issued with a few different covers. In the US the cover had a black & white outline version of the Warhol painting (Geffen). US single cover (Geffen). Back. Credit for the Warhol painting. 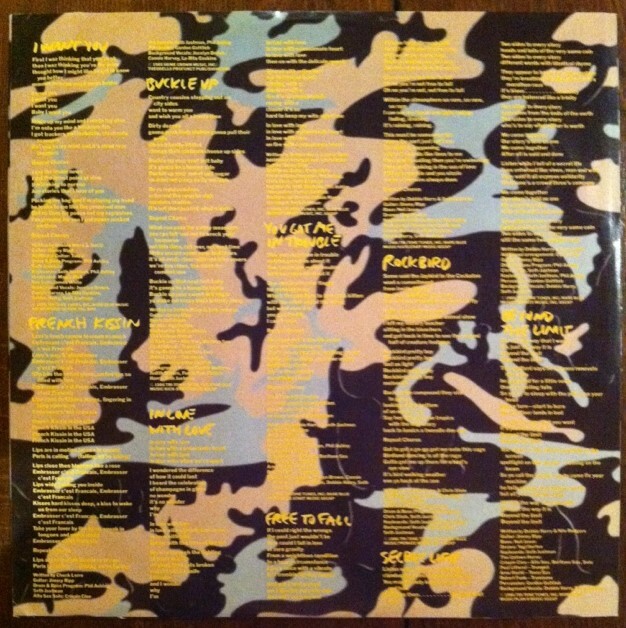 But the most interesting version was issued in the UK (Chrysalis), a 7″ record with a so called poster cover, which at that time were very en vogue in England. On this foldable poster a much larger part of the Sprouse/Warhol clothing design is visible. Also a point of interest: the layout of the poster was done by John Pasche, who at that time was creative director at Chrysalis Records. Pasche is best knows as the designer of the iconic Rolling Stones lips and tongue logo, first used on Sticky Fingers. 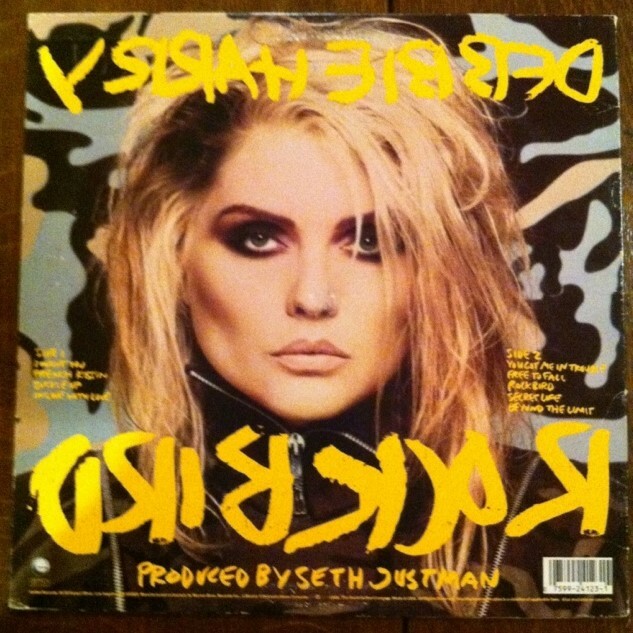 At the back of the poster Pasche isolated and repeated Debbie Harry’s lips. Which was a very Warholian thing to do. UK Poster cover (Chrysalis), front. Photography: Guzman. Art direction: John Pasche. UK poster cover, back. Lips and layout by John Pasche. There is NO credit for the Warhol painting! So this is the third time the paths of Pasche and Warhol cross on album cover art, and the second time lips are involved. 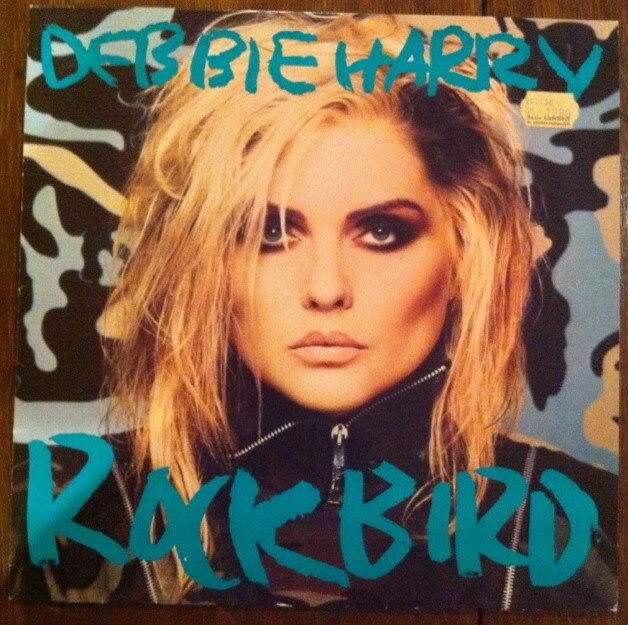 (First time was Sticky Fingers, second time was when Pasche designed the can + opener cover for the Spanish release of Sticky Fingers, third time this Debbie Harry poster cover). 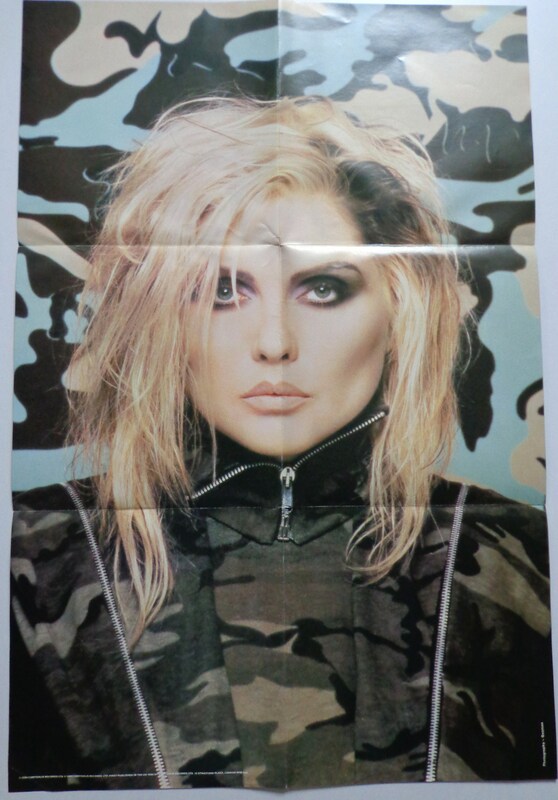 On Tumblr two absolutely fantastic pictures can be found of the Guzman photo session, in which also Deborah Harry’s face is painted in camouflage colours. These pictures, with the singer completely disappearing in the background, look a lot more aggressive. Maybe the idea was abandoned, because Harry already had a lot of explaining to do about the cover art for her first solo album KooKoo, on which the Swiss artist H R Giger pierced her face with large needles. These pictures are, to use the words of a famous vodka campaign, ‘absolut’ Warhol. In 1986 Warhol not only painted the camouflage paintings an sich, but also made camouflage portraits of Joseph Beuys, of the Statue of Liberty, and camouflage self portraits. Another museum-quality description of the Warhol/Debbie Harry/Stephen Sprouse/John Pasche covers. 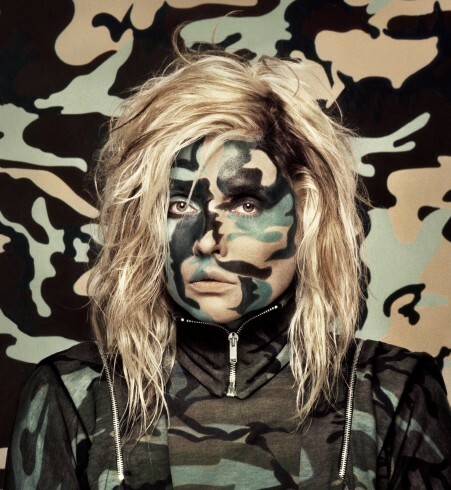 I haven’t seen the photos of Debbie with camouflage paint before! Super! Thanks Richard. I was really surprised by the camouflage face pictures myself. Found them two or three days ago, when I was looking for more information on Guzman. 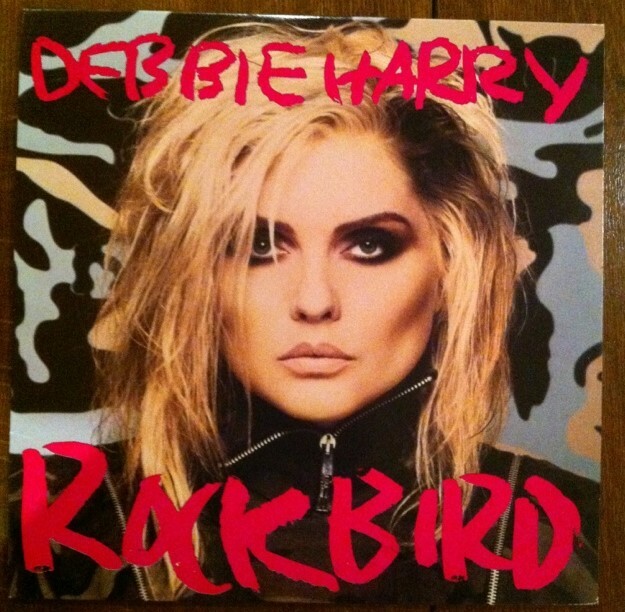 These pictures, even more than the actual Rockbird cover, look like 1986 Warhol paintings. Thank you, Eric, for the info. Was Stephen Sprouse there too? As always a great and informative post full with stuff that i didnt know. Keep it coming!